I started the year with a blog post, a short blog post, but a blog post none the less. I am hoping to write a little more often during 2015 but I'm making no promises. In the hope that it will encourage me to write a little more often I'm going to try and link up with Shanna and Melissa for A Lovely Year of Finishes every month. A great by-product of this of course is that I should have a finish every month to show for it too! Now you all know that I don't have much free time on my hands these days so I'm going to keep my goal realistic. I spent my due date, all the way back on November the 3rd, making the binding for Millie's quilt. I then attached it to the front of the quilt, folded it neatly and placed it in my hospital bag. I was fully expecting to be induced as Benji was showing no signs of moving and I'd been warned many a time that being induced can take a very long time and can be very boring. This in addition to the fact that Anwen took 37 hours to make an appearance made me think that I'd have some time on my hands and a quilt to bind would be a nice distraction. Anway, Benji was a good boy and arrived the day before I was due to be induced, also he didn't fancy dragging the process out - I was at my sewing machine less than twelve hours before I met him! Needless to say, when I arrived home Millie's quilt was untouched and I put it to one side whilst I concentrated of finishing my #igminiswap quilt. So that's my goal for January - sew the binding onto the back of Millie's quilt. Shouldn't be too hard, after all I have a whole month to get it done. Katy did such a great job of hosting the FAL last year that I really want to link up at least one project to her last finishes party. That gives me just over twenty hours during which I'll also have to make three school runs, take Anwen to gymnastics, prepare three meals, attend a swimming pool committee meeting and feed a small baby 5-6 times. Oh, and sleep, I'd like at least two hours if possible please? Like I said a realistic goal :-) I'd better get stitching! Hey good luck with the stitching! Sleep is essential but babies don't really seem to care what we think! Loving the vintage sheet on the back of the quilt. 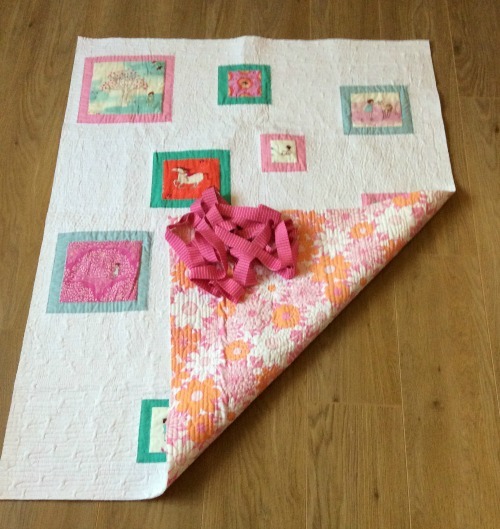 A lovely quilt to finish, I hope you get enough time to enjoy some relaxed sewing, too! Such a pretty quilt, love the quilting. Good luck with your goals!